Love is Love: MDPAN's LGBTQIA solidarity march in Ferndale. Bill 5550 has been proposed to the Michigan House of Representatives amid Metro-Detroit Political Action Network's (MDPAN) protest that Metro City Church is hosting conversion therapy sessions for teenage girls. The bill, introduced by Ann Arbor Rep. Adam Zemke, seeks to make Michigan the tenth state to ban conversion therapy (attempts to reorient LGBTQIA individuals to a hetero/cis gender and sexuality dynamic) by mental health professionals. Zemke is joined Brownstown Rep. Darrin Camilleri in calls to remove the practice. Camilleri is also demanding MI Attorney General Bill Schuette investigate the Church for any deceptive and unconscionable practices under the MI Consumer Protection Act. The protest, organized in under a week by MDPAN, began with author Sara Cunningham's posting of Metro City Church's $200 workshop for teenage girls struggling with gender and sexuality identity. The activist group quickly mobilized. Spearheaded by LGBTQIA chair Brianna Dee Kingsley and Meeko Williams, the protest drew roughly 300 to the Riverview church to support those teenage girls pressured to attend the workshop, and condemning any abuse visited upon them by church staff. One such tale of abuse was suffered by Seth Tooley, a 17-year-old transgender man, who attended a similar workshop by the church four years prior. Kim Tooley, Seth's mother, told the Detroit Free Press "My son had three adults laying hands on him — (he was) screaming so loud I heard him from the other room — praying that God will deliver him from (the homosexuality) demon". The abuse continued as the church insisted on deadnaming Seth, demanding he dress as a female, and subsequently banned him from a boy youth group within the church. With Seth's experience as a focal point, MDPAN rallied LGBTQIA community leaders such as Kingsley and Williams, Jey'nce Poindexter (Equality MI, Trans Sistas of Color Project), Char and Esther Davenport (National LGBTQ Task Force), Rev. Roland Stringfellow (Metropolitan Community Church), Pastor Tray Smith (Faith Christian Community Church) spoke alongside Seth himself. The crowd gathered had time to share their stories, an improptu speaking circle lead by Williams also shed light on the experiences of James Williams and Matt Mayes, among others. 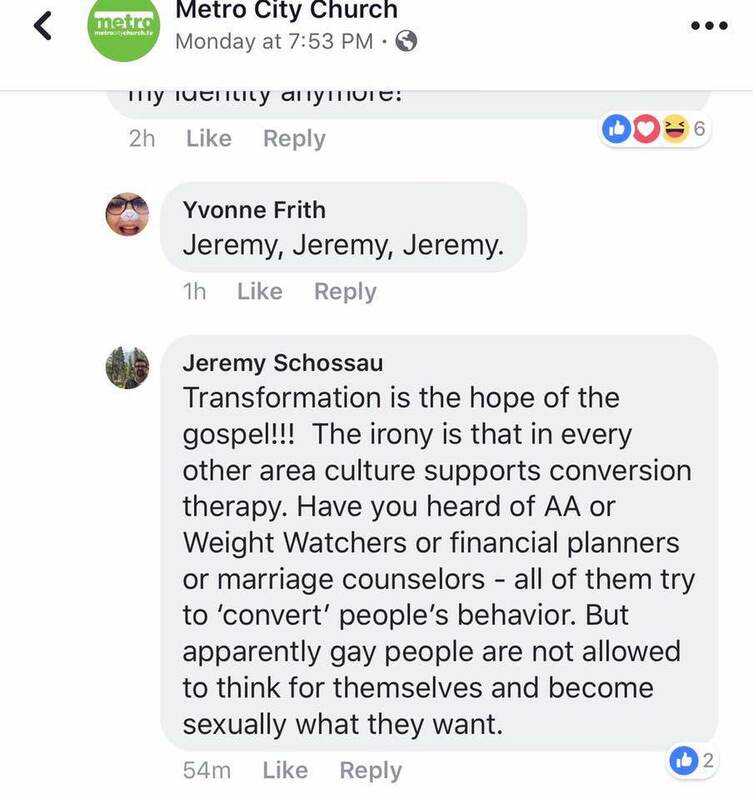 Jeremy Schossau, founder and head pastor of Metro City Church, denies these workshops feature conversion therapy. However, the Church's partnership with FORGE (Families Obediently Restoring Godly Education) Ministries suggests otherwise. A non-profit based in Texas, they bill themselves as a champion of Christian family values. Biblical verses pepper their organizational values, highlighting Mark 10:6 "But at the beginning of creation God made them male and female," and Genesis 1:28 "Be fruitful and multiply and fill the earth and subdue it and have dominion over the fish of the sea and over the birds of the heavens and over every living thing that moves on the earth." These passages forming a core of the ministry's ethos proves troubling, especially for the mental health of LGBTQIA teens, already at risk for suicide attempts at a rate five times higher than hetero/cis teens. More dubious still, the workshop is explicitly designed for girls, but lead by men. Schossau's dismissive social media comments suggest a belief that homosexuality is comparable to a drug addiction, or obesity. The logical extension of FORGE Ministry's philosophy demands there be a rigid gender binary, and that women are tasked with breeding as their primary function. When taken with Seth's account of abuse, this workshop (and others like it), can cause long term psychological damage for attending girls. GLSEN Southeast Michigan, Ruth Ellis Center, Equality MI and Affirmations have reached out while the protest was developing to offer resources for any teens struggling with LGBTQIA identity, especially those who went to conversion therapy sessions like Metro City Church's. MDPAN is taking a stand against these torturous practices. Call your state reps and tell them to back MI House Bill 5550 and make this state the tenth to outlaw conversion therapy! Join the protest next Thursday the 15th in Riverview as the call continues to shutdown Metro City Church's workshop.